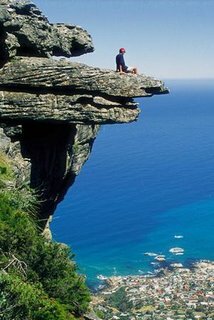 Table Mountain is a must see for any visitor to Cape Town.Its powerful and charismatic pull, draw many tourists to visit this place. The mountain is the only terrestrial feature to give its name to a constellation –Mensa which means “The Table” – standing in the Southern Hemisphere right below Orion.. Its tabular shape results from nearly horizontal layers of sandstone exposed by vigorous wind and water erosion. The mountain forms part of the Table Mountain National Park.The most easiest way of visiting Table Mountain is to ride up in the Cable Car.You can reach the top either via cable cars or if you're feeling slightly more energetic and have the time you can walk up the mountain from Kirstenbosch or Constantia. The mountain’s plateau is flanked by Devil’s Peak to the east and Lion’s Head to the west, forming a drastic drop to Cape Town and the Table Bay Harbor. The distinctive-looking mountain is one of Cape Town’s most recognized landmarks and is a popular tourist attraction that offers hiking, camping, and other activities.